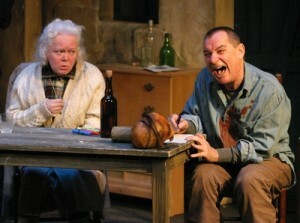 A Skull in Connemara by superstar British playwright Martin McDonagh is given its second Canadian production by Theatre Conspiracy at The Waterfront Theatre on Granville Island between June 2nd and June 18th, 2005. Skull was directed by Richard Wolfe and featured Vancouver actors William Samples as Mick Dowd, Johann Helf as Mairtin Hanlon, Wendy Morrow-Donaldson as Maryjohnny Rafferty and Adam Henderson as Thomas Hanlon. Original music by Chris Hind. Lighting design by Alan Brodie. Set design by David Roberts. Costumes by Sandy Buck. Staged Managed by Anne Taylor.